In this gentle, poetic young graphic novel, Dounia, a grandmother, tells her granddaughter the story even her son has never heard: how, as a young Jewish girl in Paris, she was hidden away from the Nazis by a series of neighbors and friends who risked their lives to keep her alive when her parents had been taken to concentration camps. Loïc Dauvillier is above all a book lover. He has penned a great many picture books and comics adaptations of classics (Around the World in 80 Days, Oliver Twist), as well as other more personal and autobiographical works. 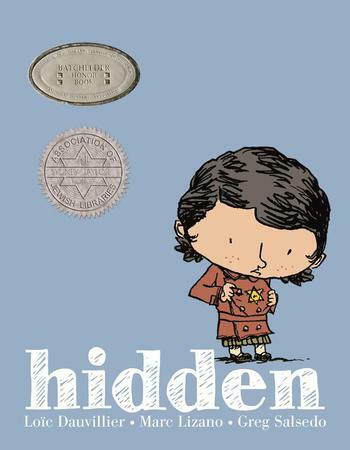 Hidden is his first collaboration with Marc Lizano and Greg Salsedo. Marc Lizano has lent his pen to over forty books. Today he is one of the most sought after cartoonists and works in a wide range of styles and genres on graphic novels and picture books for young readers and for adults. He collaborated with writer Loïc Dauvillier and colorist Greg Salsedo on Hidden. Greg Salsedo is a highly regarded young French comics colorist and designer. His books include the graphic novel Hidden.